After 55 years of production, the Seated Liberty motif was finally retired in 1891. Considerable debate led up to the introduction of Barber coinage in 1892. Designed by Mint Engraver Charles Barber, the same obverse appeared on the Dime, Quarter, and Half Dollar. The first Barber Dimes were minted on January 2, 1892. The rarest date for Barber Dimes by far is the 1894-S. Most collectors can forget about obtaining the 1894-S, as it is one of the greatest rarities in all of American numismatics. According to Hallie Daggett, daughter of former San Francisco Mint superintendent John Daggett, her father arranged to have 24 specially struck "S" dimes in 1894, presenting 21 of them to banker friends. Hallie received the other three 1894-S dimes, spending one of them for ice cream on her way home from the Mint. It wasn't until 1954, when Hallie sold her two remaining 1894-S dimes, that she confirmed the origin of the legendary coins. Only nine of the original 24 are accounted for today. An example of the 1894-S was sold in July 2007 for $1.90 million. The exact same coin brought $1.32 million in 2005. 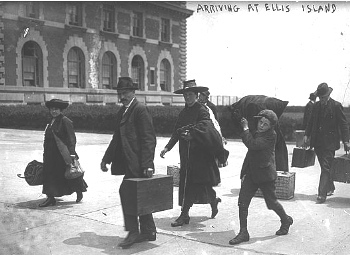 The Ellis Island immigration center opened on January 1, 1892. More than 12 million people entered the U.S. through Ellis Island from 1892 to 1954. People from around the world left their mother countries to come to America, in search of a better life. After the boats docked, immigrants would disembark and walk into the Registry Room where doctors examined them for medical problems and officers reviewed their legal documents. The day after Ellis Island welcomed its first immigrants, the Barber Dime was released into circulation. 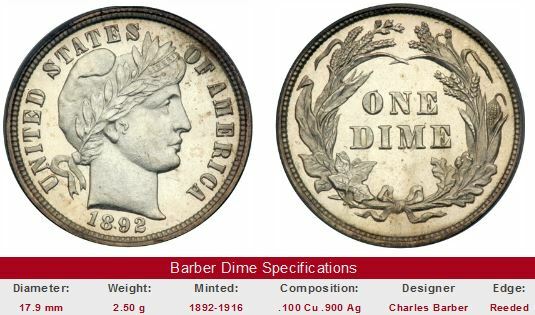 The next most valuable Barber Dime is the 1895-O. Disregarding the 1894-S, it is considered THE key date of the Barber Dime series. The 1895-O doesn't have the stellar performance of key dates belonging to more popular coins (e.g. Lincoln cents), but any Barber Dime enthusiast must have it to round out a collection. The 1895-O always has been and always will be tough to find. The links in the right hand side of the "Sales Box" below will bring up all the 1895-O Barber Dimes, if any, available right now on eBay coin auctions. The left hand side of the box illustrates value trend data over a very long period of time for the 1895-O in G-4 condition. The percent annual increase is computed for comparative purposes. The coin pictured for sale in the right hand side, if any, is not necessarily an example in G-4 condition.